Please select an option in order to proceed to the next step. Please choose a server location. The closer the server is to you, the faster your site will operate. Tip: SSD Hosting work well also at further distances. Find the the most suitable Web Hosting company for your needs. Utilize the Filters menu on the right and mark your choices. How to host a website in 3 easy steps. The real down to earth and basic explanation on how to host a website in 3 easy steps. Finding the right solution for hosting your website may be your most important decision you make for your website. It does not really matter whether your website is a company website, blog or ecommerce shopping site, choosing the right hosting is what will allow you to share it with the world. Disk Space: This relates to the amount of storage space you will get on the server. All the relevant information of your website will be stored here. The more information and media files you have on your website the more disk space you will need. Sometimes it is better to take more than you need in order to avoid confusion and expenses later on. Bandwidth: The more visitors visiting your site the more Bandwidth you will need. If you have low bandwidth and lots of visitors your site will be slow and your visitors will not be happy and may not return. Yes it is that easy! Except… maybe not. How do you know what the right hosting company is for you? How do you know what package you need? And what domain would be the right one for your type of website? When choosing a web hosting company you will want to choose a company that will support your website and business. When we say support we mean a web hosting company that can provide you with good loading time, almost perfect uptime, security against hackers and viruses, and technical service 24/7. These are just the basics. In order to check these out you will want to read reviews of real customers. The advertisements don’t always tell you the exact truth and there is no better information that someone who has been through this before you. Make sure the hosting company has at least 3 ways of contacting their technical support such as: Phone, fax, email, chat, tickets etc…. You can never be sure when you will need them. They should be available 24/7, 365 days a year including Christmas! Loading speed is also super important, if the site loads slow you will land up with visitors or clients abandoning your website and this causes loss of money and a bad reputation. If your site is going to be heavy with rich media or you expect thousands of visitors you should take a larger package. For more information on this step feel free to visit our blog or resources pages and you will find various articles with more in depth information. 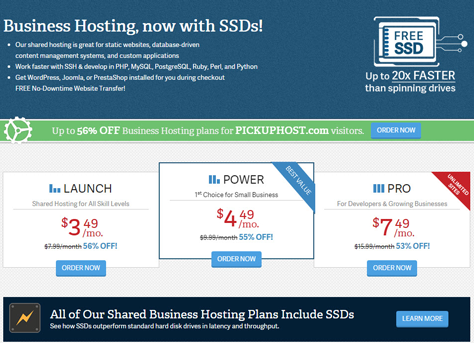 Most beginner websites or blogs can settle for the basic package of a hosting service. You may want to get a package one level higher to allow room for growth or you can choose to deal with that at a later stage. It is totally up to you! In your hosting package you will want to check if you get a free domain or if you will need to purchase one separately. Sometimes it is worth adding a few dollars to get the domain included in your package - this you will need to check separately with each company. The one thing you will need to decide when before purchasing a package is whether you will need a dedicated server or a shared server. Shared server packages are cheaper by far! The only reason you will need a dedicated server when starting out is if you are building a website or online store of a huge brand and expect to get huge amounts of traffic. If your package includes a free domain you will not need to spend anything extra and you can now be creative and choose the name of your domain. For popularity reasons and Search engine marketing it is always best to choose a domain with a .com ending. When choosing a name for your domain try choose a name that can be catchy and has a connection to what the site will be about. For example if you will be selling shoes, you won’t want to call your site beautiful.gowns.com but rather beautiful.shoes.com. Many of the popular domain names already belong to others. If you want to make a play on words don’t use numbers- it does not work that well but you can try underscores. you can also try using adjectives that sound cute. Once you have your domain you can start building your website with a content management system like WordPress. Check out our articles on getting WordPress through your web hosting company. Now here is what we promised!!! The easiest way on how to host a website in 3 easy steps!!! You won’t believe it but we have created the perfect tool to do this for you! He is cool, calm and collected and he can do the magic for you! With just a few details from you our Wizard will pull out his wand and mumble a few words and will provide you with a short list of the best web hosting companies or services for your needs. So what are you waiting for? Within 10 minutes you can be the owner of a domain and website on the internet.